There are a lot of people, organizations, and governments that are interested in the innovative culture of Silicon Valley as well as PBwiki’s unique structure that focuses on hiring (and listening to) some of the brightest people in the world. We’ve hosted a delegation from the French government in our office, spoken to SwissCom, and most recently our founder, David Weekly, gave several talks in Mexico. Here’s the slides for the talk he gave this month at ITSEM, one of the most prestigious business schools in Mexico. Watch a video of this talk (in three parts). You can also see David’s pictures on Flickr from his trip to Mexico City, which includes a tour of some of the major pyramids and rafting down the Filobobos River in Tlapacoyan. “These applications and services will allow teachers and students to collaborate in ways that students have never imagined. The uses are virtually unlimited. Most of us here at CMSWire probably can’t even count the ways we could have utilized such technologies back when we were in school. Yesterday, we rolled out a new settings panel for all PBwiki 2.0 wikis, making it easier to control the settings on your wiki. See details about the new settings panel. For the last several months, we’ve been researching and designing a new way to add users to wikis without email addresses — notably, K-8 students. 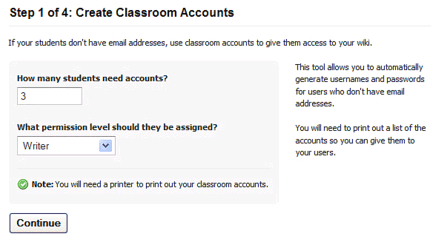 Today, we’re happy to announce a new feature, Classroom Accounts, which will let you add users without email addresses. In consultation with dozens of educators, we’ve created a system that makes it unbelievably easy to add your students to your 2.0 educational wiki. First, I’ll show you a video of the feature. Then, we’ll go into detail using a short tour with screenshots. Classroom Accounts from PBwikiWebinars on Vimeo. Now, let’s look closer at each of those screens to see how they work. 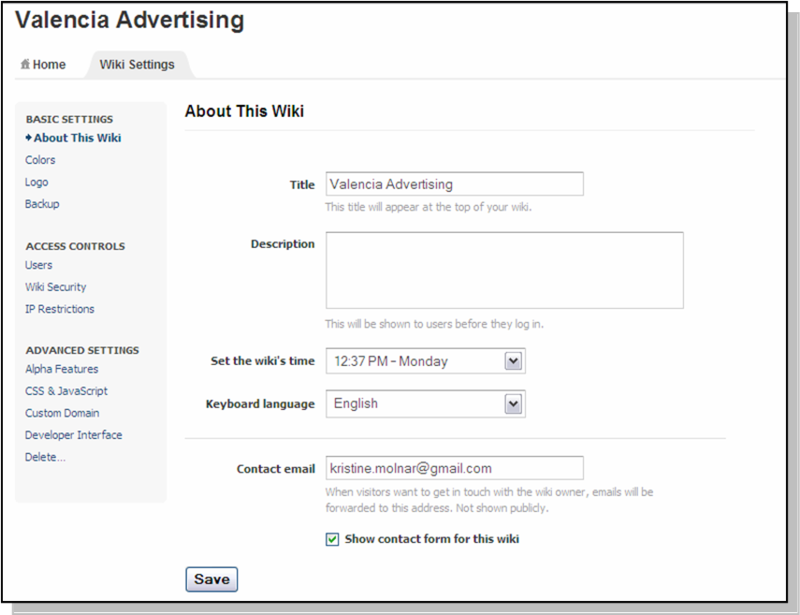 In your new PBwiki 2.0 settings panel, you’ll see a small graphic to invite users without email addresses. 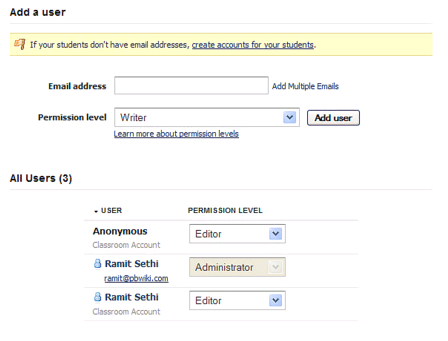 Enter in how many students need accounts and what permission level they should be assigned. Note that you should have a printer to complete setting up Classroom Accounts. 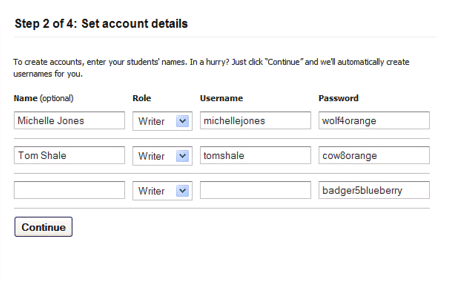 Type in your students’ names and we’ll automatically create student-friendly passwords. Don’t have time to enter all your students’ names? Just click “Continue” and we’ll automatically create usernames for you. That’s it! Now click “Print” to print your usernames and passwords. Here’s a view of the handy PDF so you can hand it to your students. We paid special attention to the design of the PDF to make it easy to cut and distribute. We also email you a copy of your new Classroom Accounts. A: If you haven’t converted to PBwiki 2.0 yet, please click the “Convert now” flag at the top of your wiki to update for free. If you don’t see it, please sit tight for a short time while we finish polishing a few features for your wiki. We’ll enable you to update to 2.0 as soon as possible. A: This feature is enabled for educational wikis only. If you need to switch categories, please click “Help” at the top-right corner of your wiki and let our support team know. They’ll switch you over right away. A: No problem. 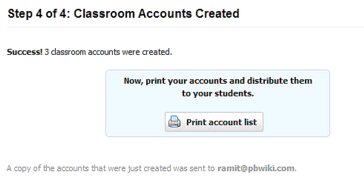 To get help, check out the PBwiki manual entry on Classroom Accounts. Based on testing, we’ve heard some great feedback on this feature. If you’re an educator, give it a shot. And, as always, let us know what you think! Note: Attention educators! Are you interested in getting a free Gold Premium wiki (value: $250) for your classroom this year? Sign up to get an early look at the PBwiki Back to School Challenge. Other feedback? Please let us know! Right now the improved settings panel is being rolled out to all education wikis, all others will see this new setting next week (Aug 18, 2008). Today wiki administrators will see an improved settings panel — with a new interface and easier navigation. 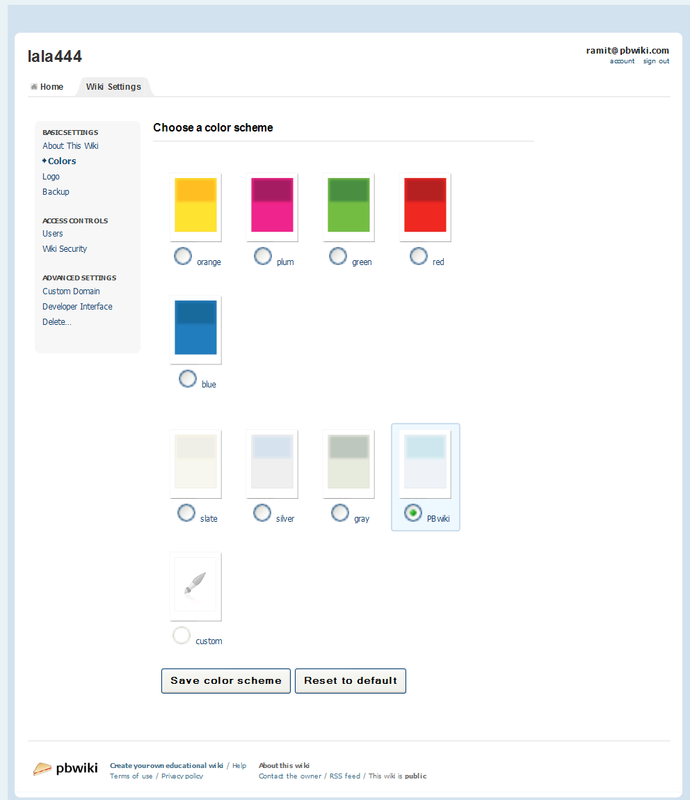 • Use the ‘Basic Settings‘ features to customize your wiki – change the color or upload your logo. 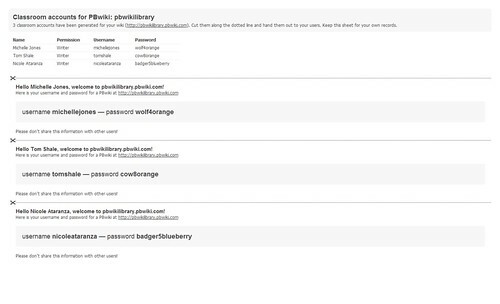 • Use the ‘Access Controls‘ to invite users, change your wiki’s security setting, or set request access. • Use the ‘Advanced Settings‘ if you want to add custom CSS or modify your wiki’s API. We’ve just rolled out improvements to PBwiki RSS feeds. RSS feeds are a great way to stay up-to-date when you have lots of things you’re interested in. You can subscribe to a feed and have new information show up automatically as soon as it’s available. PBwiki has offered RSS feeds for quite some time now, but this week, we rolled out a great new version for 2.0 wikis that is much more powerful. The Recent Changes feed. This includes all of the changes being made on your wiki that you have permission to see: page edits, comments, file uploads, you name it. Page-specific feeds. This includes all of the edits and comments made on whichever wiki page you’re currently looking at. Folder-specific feeds. These show up if you’re looking at the contents of a folder on your wiki. Click the one you’re interested in and subscribe. Be sure to let us know what you think!